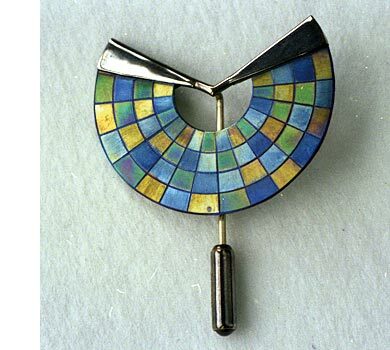 Debby Moxon first used titanium while a student at Sheffield in 1980 when she wanted coloured hands for a clock. It was only after graduation that her real exploration of the material began. Inspired by the intricate images of Ed de Large, she developed her own heat-colouring techniques involving many steps to produce precise, controlled geometric designs. Over the years she has refined and expanded her colouring and construction methods. Layered and riveted construction and additive and subtractive masking are all dictated by the properties of the metal. The latest pieces continue her experimentation with heat and titanium.